At this time and era where we see everyone immersed in their own partners, it is a warning as to whether we are really ready to move on to the next phase of life. Are you? 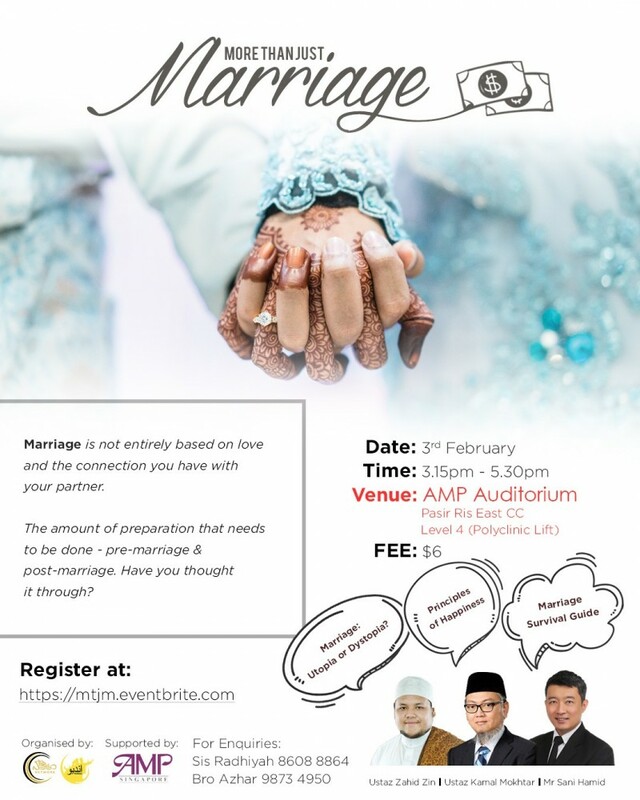 At just $6* with very limited seats, our objective is to raise awareness of how marriage is not entirely based on love and the connection you have with your partners. The amount of preparation that needs to be done - pre-marriage & post-marriage. Have you thought it through? Below are a few questions and some small puns you can bring to the event. - Is it a beautiful wedding or a beautiful marriage that you want? - So you got her in dunya, Alhamdulillah. But are you going to be with her in Jannah? - You mean to tell me you think you can manage a spouse, when you are not financially stable yet? - Don't let her hand go when you're in the mall. You may think it's romantic, but really it's just economic.